I am trying to get the wordbook plugin to post on my facebook wall. 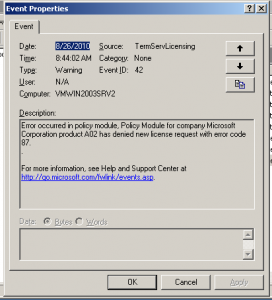 Event ID 21 and 42 – Terminal Server license errors. 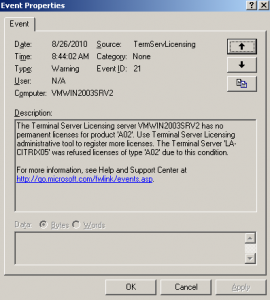 If a Windows Terminal server client receives the following kind, they need to remove the corrupt license registry key on the client. 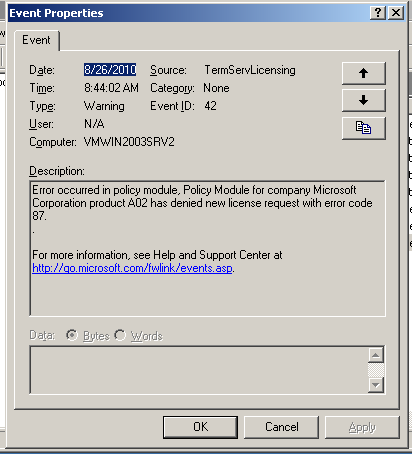 The following two messages were identified on a Citrix license server. 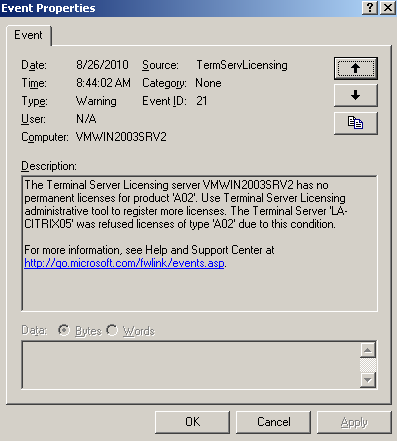 The key will be recreated the next time the client connects to the Citrix server. How to increase shmmax kernel parameter in linux. Used the following to modify the shmmax kernel parameter in Fedora 13 after updating postgresql on a machine running WiKID for two-factor authentication. Changes the parameter so a reboot is not required. If you are making changes you want to save, make sure you switch back before saving the file. Otherwise, you end up saving the file as the text you see when viewing the file in hex mode. I ended up having to just restore the old files. Someday when I get more time, I will figure out what is wrong. I believe the plugin is too new for the version of Yourls I am running (1.2). I am having trouble with the yourls plugin for WordPress, since I updated it this morning. It keeps saying the username or password is incorrect despite manually verifying them. Might have to test sending some tweets. Sorry. Recently, I was up in the heart of San Francisco. As somebody who lives about 15 miles north of the San Fernando Valley in Los Angeles and gets ok AT&T/iPhone service, I have to say that I think that people that are complaining in the Bay Area are a bunch of spoiled, whining babies. From every corner of the city, I was amazed by the great service I was getting compared to what I get at home. Just goes to show you, it is all relative. Come to Santa Clarita Valley and then you guys might have something to complain about. Create a custom SMS/MMS tone on an iPhone. 7.) Enter the desired time range that you want and click “Ok.”. It should be less than 30 seconds in duration. 9.) Rename the resulting .aif file to sms-received[1-6].cap. For example: Rename myfile.aif to sms-received1.cap. 10.) Ensure that ssh is installed on your jailborken iPhone. 11.) Replace one of the sms-received[1-6].caf files in /System/Library/Audio/UISounds with your newly created sms-received[1-6].cap file. I used FileZilla to transfer the file from my Mac to the iPhone, but you can use any sftp/scp client or the command line from Terminal. 12.) Now, on your iPhone, you can find your newly create sound in Settings/Sounds/”New Text Message.” The selection names do not change, but you can select each one to hear the sample to find your custom SMS/MMS text sound. 13.) Remember to switch back to Import Settings in iTunes.